Yesterday, my mom had an appointment for a ‘routine’ stress test. I was the designated driver (since my mom, 86, doesn’t drive). While she had the test, and I sat in the waiting room… I doodled! 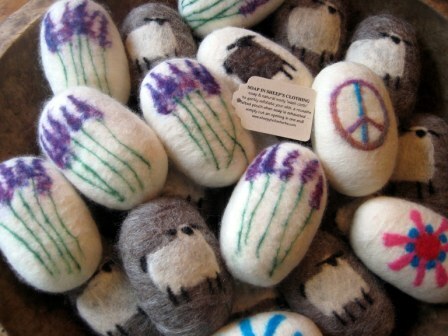 Not with paper and pen, but with WOOL. YES, W.O.O.L., really! 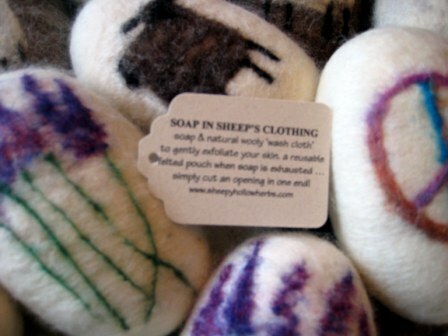 Besides my more traditional, well-loved sheepy felted soap, I also ‘felt’ other images, including free-spirited or free-styled ‘doodles‘. I had pre-wrapped my soap in wool roving beforehand. 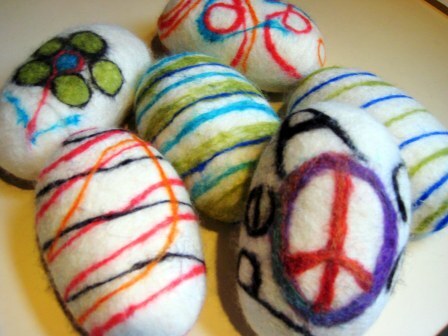 As I headed out the door, I grabbed my bag of colored roving and my felting needle. 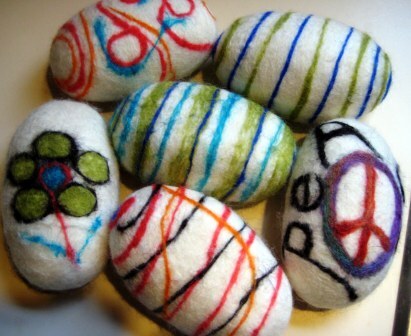 With felting needle in hand, I doodled away…with no particular road map. 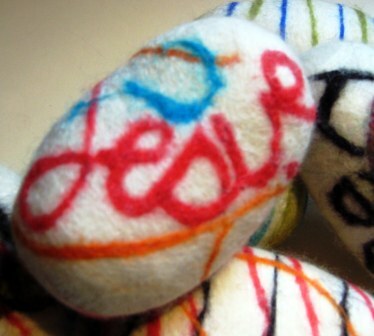 Doodling with wool is a good thing! I made all natural, eco-friendly laundry soap! Actually, I’ve wanted to make it for quite some time. I started off with my all-natural castile soap (but you could substitute Fels Naptha ~ most commonly used ~ Zote, Ivory brands) grated fine. SOAP serves as a surfactant to help loosen and wash away ‘dirt’. Then I added all natural borax (a natural occurring mineral salt, sodium borate), also referred to as desert salt. It’s a crystalline powder, mildly alkaline, water-soluble, aides in softening water, loosening dirt & deoderizing ~ also found in the laundry section of your grocery store – look for 20 Mule Team brand. Another key ingredient, a white powder is washing soda (sodium carbonate or soda ash ~ NOT baking soda which is sodium bicarbonate) to boost the cleaning and stain fighting powers without the damage of bleach. Look for Arm & Hammer brand in the laundry aisle at the grocery store. Optional: OxiClean may be added to your ‘recipe’ for heavy-duty farm loads! 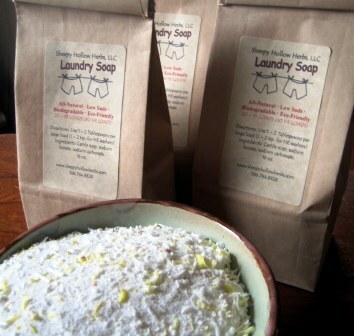 Best of all, home-made laundry detergent is skin safe, environmentally friendly & inexpensive! Mix all ingredients into a granular mixture. Use 1 tablespoon per load; 2 tablespoons for large or dirty load. BTW, you could add essential oil to your laundry mixture. Also, if you have the need for a laundry rinse, use 1/4 cup white vinegar in the rinse cycle. It will remove any soap residue and reduces static on your clothes…and won’t leave your clothes smelling like vinegar! I’m done felting soap…for now. Still have to wrap & package it, but it’ll be ready for the Mt. Bruce Station Fiber Festival. 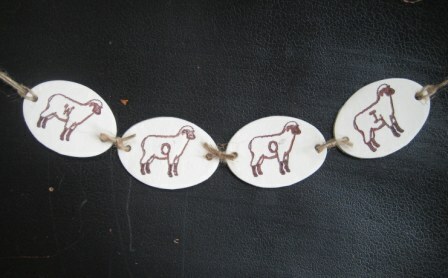 Next, I made a primitive ‘W-O-O-L’ sheepy clay swag…does this qualify as fiber art?? 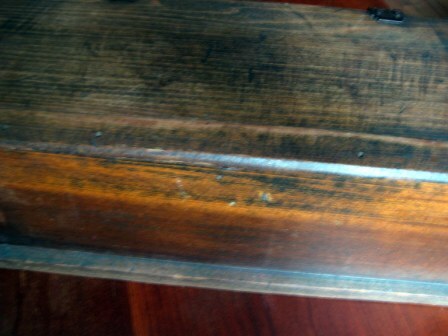 I recently purchased a small old wood box…square nails and all! I’d like to make a ‘special’ prim wooly sheep to affix to the interior lid. I’m still think’n on it, but will keep you posted with what I decide. It’s so dark & stormy outside, picture-taking isn’t the greatest. I’m also thinking AUTUMN/FALL and all the glorious earthy fall colors. BTW, I had to turn the car heater on today…GAK! So, I will be making a variety of flower-y pins to accessorize coats, bags, etc. 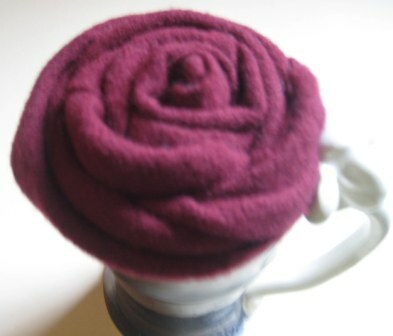 Here’s a sneak peek made from recycled wool. Maybe I can sneak in a prim Halloween-y sheep or two?? I have a million ideas, hope I can get to it…so much to do! Hope you’re safe and staying dry where you are! Matt was home over an extended 4-day weekend (mid-terms) so I spent lots of time rattling the pots and pans in the kitchen preparing his ‘favorites’. Used up the last of my goat’s milk cheese with baked manicotti…YUM! I made meatloaf – it’s always a family fav – for another supper, and last, stuffed green peppers with a basil/tomato sauce with pick’ns from the garden just before the hard frost. For dessert, I had to bake an apple strudel…but not the type you’re probably most familiar with…light airy filo-type crust? 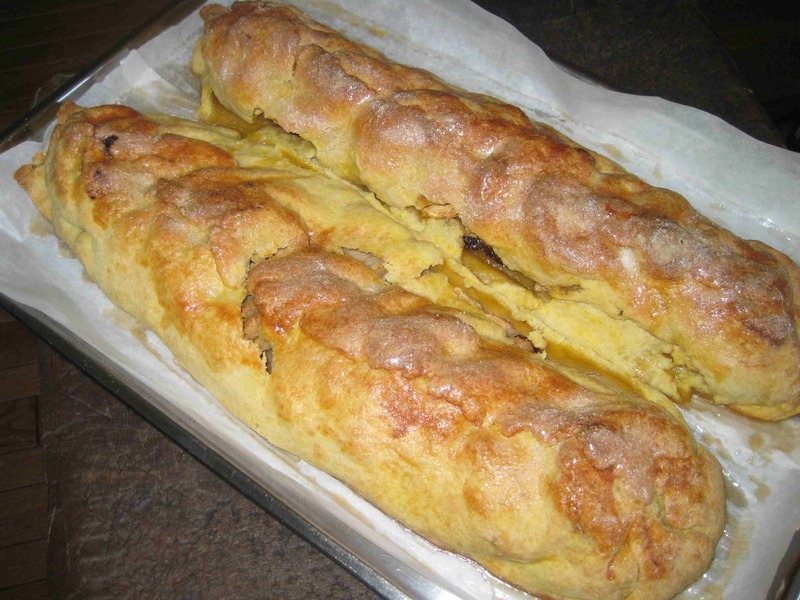 This ‘apfel’ strudel is my mom’s recipe from the ‘old country’, Nieder Osterreich (Northern Austria) from a little farming village called Rastenfeld where my mom was born and raised. It’s a simple-folk farmer’s hearty-type dough, made with flour, sugar, butter, sour cream, milk and egg yolks. It rolls out easily and is then filled with fresh sliced apples, sprinkled with sugar and dotted with butter (I toss in a few raisins and a little cinnamon). Another BIG Y-U-M! Here’s the recipe, made the old-fashioned way – BY HAND. NOTE: MAKES TWO APFEL STRUDELS: In a large bowl, add 4 1/2 cups flour, 2/3 cup sugar, pinch salt. Stir with whisk. Now, make a hole in the center of the flour and add: cut in 2 sticks butter, 4 tablespoons sour cream, 4 tablespoons milk, 4 egg yolks (reserve the whites to brush on top of the strudel if desired). Now comes the fun part! Push up your sleeves and with your hands, begin to pull in flour from sides and incorporate into the ‘wet’ ingredients. Once you have formed a ball of dough – of sorts – turn out onto a floured dough board and work gently adding a bit more flour if needed until ingredients are all incorporated and smooth. Put finished dough aside under the bowl while you prepare your apples. Peel, core ‘n slice 7-8 large apples (I use Northern Spy but any good baking apple will do. Now, back to the dough…cut the dough in half (makes 2). Roll out half the dough to fit lengthwise on a parchment paper lined 11 X 17 baking sheet, approx 1/4 inch thick. Arrange sliced apples down the center of dough. sprinkle on sugar to taste, add cinnamon & raisens if desired, and dot with a few bits of butter. Gently fold over dough to center and pinch ‘n tuck ends closed. Brush on egg whites and sprinkle with sugar if desired – OR – when baked, just dust strudel with powder sugar. Repeat process with second half of remaining dough (for second strudel). Transfer from wood board to baking sheet, next to first strudel (see pic). Bake at preheated 350 degrees F until golden brown, juices should be flowing, approx 45 minutes – 1 hour. Remove from oven and allow to cool before slicing. Enjoy! Before I could USE the drying barn (I forgot to mention sequencing) – remember ALL that lavender drying all over screens and racks in the drying barn??? Well, it took me two days, but I finally ‘garbled’ (that is, removed all the leaves/buds from the stems) every bit of lavender I had harvested this past summer and temporarily stockpiled in the barn. YEAH – well done! Smells heavenly. I saved some of the longer lavender stems to bundle and use as scented ‘faggots’ for the fireplace. And, I also made another batch of goat milk soap – this time I used peppermint and rosemary essential oils and some of my farm-raised organic peppermint for color. TIP: I use a ‘dedicated’ electric coffee grinder for grinding herbs and other botanicals for creating various herbal sundries. I always look forward to soapmaking day – the kitchen is usually filled with wonderful scents. After the soap is allowed to “set” for approx. 24 hours, I remove the soap (in this particular batch, a 10 pound loaf) from the mold. TIP: Use freezer paper to line your mold for easy release. I immediately cut the soap ‘loaf’ into individual bars. TIP: A non-serrated knife/blade makes a clean cut and/or a cheese-cutter (straight or curly/fancy blade cuts the soap nicely. Sometimes you can find them at the dollar store. I usually get anywhere from 24 – 30 bars depending how I cut the loaf. TIP: A small old wood drawer makes a nice soap mold! The bars of soap are placed on wire racks where they’re allowed to cure/harden for another 3-4 weeks before the soap is used/sold. Last, but not least, hubby also mulched our veggie garden compost with his chipper/shredder that operates off the tractor PTO. 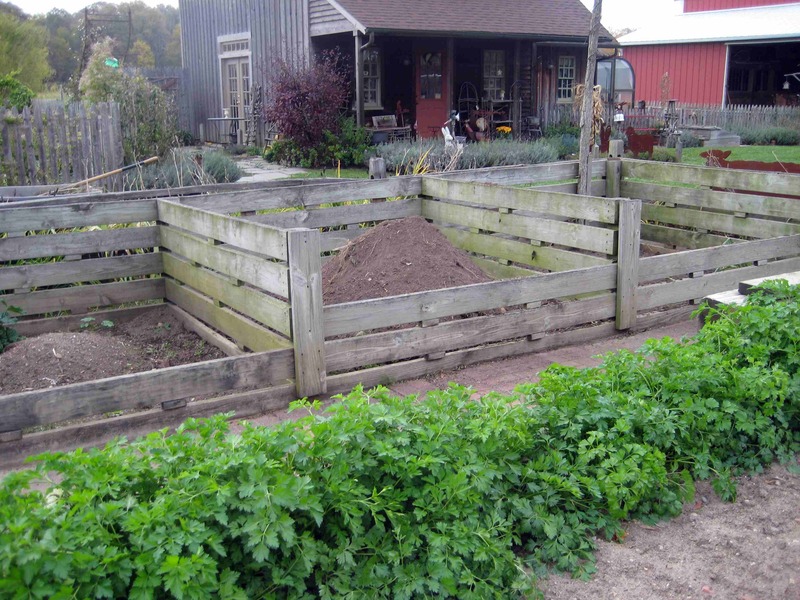 We have a 3-stage compost system. One bin accumulates, one bin is in-process/cooking and one bin is the final ‘product’ …which is usually always empty because we put it right back into the garden beds in the Spring. Since we already got hit hard with frost several times, I’ve been cleaning-up the garden beds and accumulating lots of garden debris. 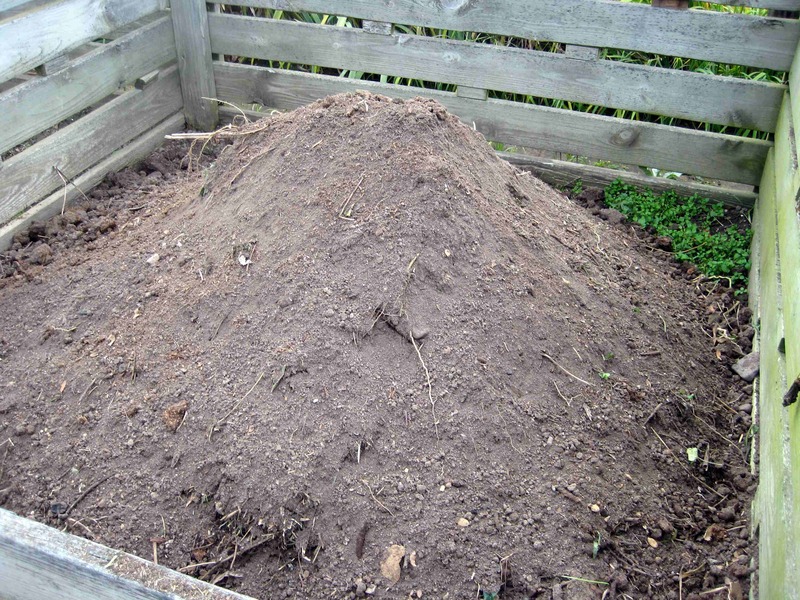 You increase the rate of decomposition by increasing the surface area…that is, chop up your veggie waste. Here’s the final product – it looks almost ready to place back into the garden – full of nutrients for next growing season! That’s flat leaf parsley in the foreground – normally lasts in the garden ’til Thanksgiving. I’ll pick lots and share with family. I’ll use some to make a parsley pesto and prefer to freeze the rest since ‘dried’ parsley begins to loose its flavor quickly. For the last couple of weeks, I’ve been busy in the kitchen – making SOAP! If you make soap or have purchased and used hand-crafted soap, you know it’s one of life’s little luxuries! It seems soapmaking at home has become very popular, and nearly every other “artisan” enjoys making soap. It’s one of those ‘natural’ farm chores and makes a wonderful gift too! But, before I pass along a few soapmaking tips (which are simply based upon my own experiences, trials and tribulations), let’s review a little soapmaking history. 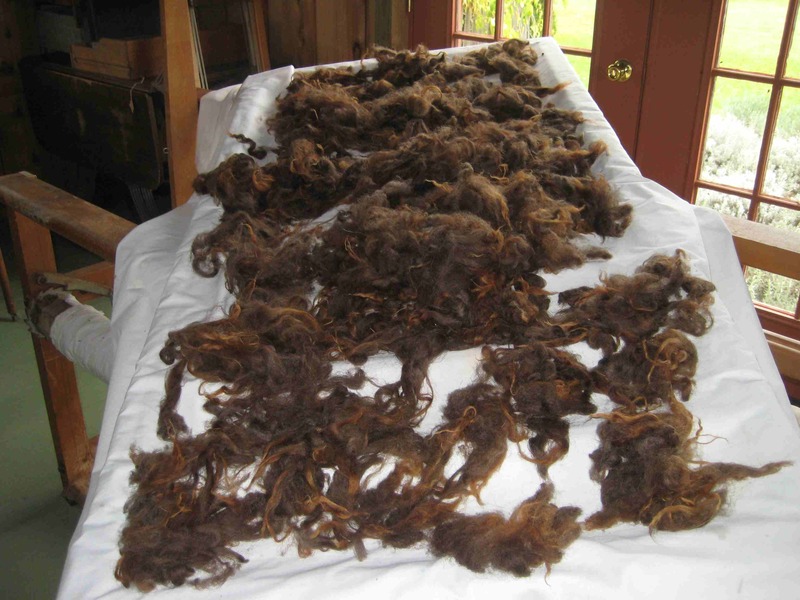 Soapmaking was a homestead skill often forgotten in discussions of colonial days. Soap was of great value in keeping the household a far better place to live and work. In colonial days, hard-working colonists made soap from the lye collected from wood ashes and waste fats which give testimony to early American self-sufficiency and resourcefulness. 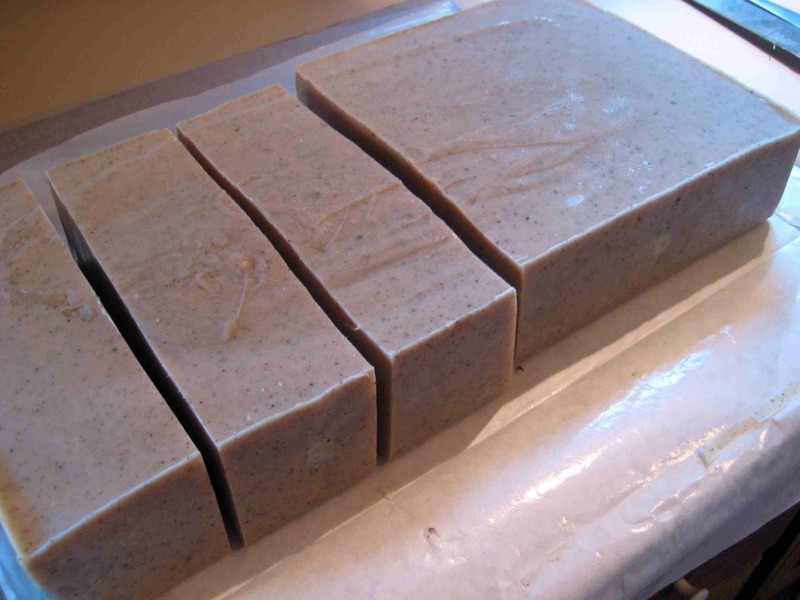 Soap, an easy item for us to obtain, was produced by boiling wood ash lye and fats together. At first, the earliest settlers simply brought a plentiful supply of soap along with them. 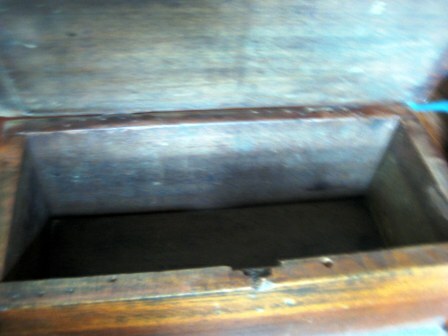 The Talbot, a ship chartered by the Massachusetts Bay Company to carry persons and supplies from England to its colonies at Naumbeak now known as Salem and Boston, listed among its cargo 2 firkins of soap. A firkin is an old measurement which was a wooden, hooped barrel of about nine gallon capacity. John Winthrop, who was to become the first governor of the Massachusetts Bay Colony, when writing to his wife in 1630 from Boston included soap in a list of necessities to be brought on her crossing to the New world. After the colonists were settled and had been able to survive the first years of hardships, they found it more advantageous to make soap themselves using the copious amount of wood ashes, a natural result of their homesteading activities. With also a plentiful supply of animal fat from the butchering of the animals they used for food, the colonists had on hand all the ingredients for soapmaking. They did not have to rely on waiting for soap to be shipped from England and waste their goods or few pieces of currency in trade for soap. Soap is not found in nature, but it can be created by a very simple process. In this way it is similar to bread, wine, glass, cheese, pottery, and other useful items produced by early peoples most likely by accident at first then by design. Soap with some work and luck could be made for free. Soapmaking was performed as a yearly or semiannual event on the homesteads of the early settlers. As the butchering of animals took place in the fall, soap was made at that time on many homesteads and farms to utilize the large supply of tallow and lard that resulted. On the homes or farms where butchering was not done, soap was generally made in the spring using the ashes from the winter fires and the waste cooking grease, that had accumulated throughout the year. “Saponification” is the chemical word for the rather complex but easy to create soapmaking reaction. Saponification is what happens when a fatty acid meets an alkali. When fats or oils, which contain fatty acids are mixed with a strong alkali, the alkali first splits the fats or oils into their two major parts fatty acids and glycerin. After this splitting of the fats or oils, the sodium or potassium part of the alkali joins with the fatty acid part of the fat or oils. This combination is then the potassium or sodium salt of the fatty acid…resulting in SOAP. Use separate soapmaking pots (I prefer stainless steel or enamel), utensils, etc. from your every day cookware! ALWAYS weigh your ingredients! Don’t rely on volumes in a recipe. Don’t forget to ‘tare’ your measuring “vessel”. That means, subtract the weight of the container from the weight of your oil, etc. When trialing new recipes, make a small batch; if it goes badly, minimize your material loss. Follow the recipe exactly; you can always modify the recipe next time, after the INITIAL sample batch. If you use individual molds (it has it’s merits, but I prefer a more primitive bar), it’s probably a good idea to have a ‘back-up’ LOAF-type mold ready to go (that is, lined or greased) just in case your soap recipe hardens/thickens while you’re fiddling with painstakingly pouring each and every individual mold!!! Again…minimize your loss. I can tell you I’ve grabbed a cardboard or paper box off the pantry shelf in a panic a time or two…LOL. Always slowly add the lye/water solution to the fats & oils. (HINT: Acid to water ‘ya ought to). Have a bottle of white vinegar on hand to neutralize spills. Always wear safety glasses; I usually don’t wear gloves…I’m bad! If you’re using goat’s milk in your recipe, I like to freeze my goat milk in ice cube trays and store in the freezer for soapmaking day. Weigh out the required amount of milk and then add the lye to the frozen/slushy milk – SLOWLY! Unless you’re interested in carmelizing/scalding the milk for a more primitive-looking soap. Insulate your soap during initial cure (cover with a blanket, put in an old ice chest, use a lid with wood molds). Cut your loaf mold after 24 hours.